ADLINK Technology, Inc., a provider of cloud-based services and embedded device solutions, has announced two new products based on the Intel Xeon Processor E5-2600 family (codename Broadwell-EP). These products are based on 14nm technology-based, server-class Intel processors that bring intelligence to IoT applications, and include an AdvancedTCA processor blade and network appliance featuring ADLINK’s Modular Industrial Cloud Architecture (MICA). The new products target networking, communications for manned and unmanned vehicles, security and other data center applications where ruggedness is critical and computing requirements are demanding. The ADLINK aTCA-9715 40 Gigabit Ethernet AdvancedTCA processor blade features a dual Intel Xeon E5-2600 v4 family processor (28C/56T) and Intel C612 Chipset and Intel Communications Chipset 8950. The blade offers 16 memory sockets supporting DDR4-2133 REG/ECC VLP RDIMM up to 256 GB, and on-board bootable 32G mSATA flash (up to 256G). Interface options include dual Intel XL710-AM2 40GBASE-KR4 Fabric Interface Channels, three USB 2.0 ports on front panel, VGA, USB1/2, LAN1/2 and COM (mini-USB) ½. The aTCA-9715 supports Intel Data Plane Development Kit (DPDK) and Intel Node Manager 3.0. The CSA-7200 2U 19″ MICA network appliance features the Intel Xeon processor E5-2600 v3 with Intel C610 Chipset. The CSA-7200 is part of ADLINK’s new MICA platform, an industrial-grade delivery system designed to support the native virtualization requirements for software-defined networking (SDN) and network function virtualization (NFV), while integrating a wide range of the latest hardware acceleration technologies to boost the processing of network packets and video streams. 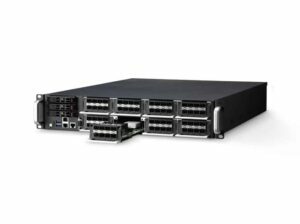 The CSA-7200 offers up to 64x 10GbE SFP+ ports with I/O intensive architecture and flexible storage interfaces, including SATA, PCIe and M.2. The appliance is highly scalable with eight Network Interface Modules, offers advanced chassis management and is IPMI v2.0 compliant. The 2U 19″ rackmount form factor is ideal for communications infrastructure deployments.